I got on a roll putting up the photos from the Magnolia Rouge shoot this morning so thought I would get on and do the winter elopement shoots we did here last year with our elopement photographer Clare Kinchin, our elopement florist Amanda Randell and our preferred elopement hair and make up duo, Jodie and Chloe from The Hair Lounge Tavistock and Jess from Visage Aesthetics. 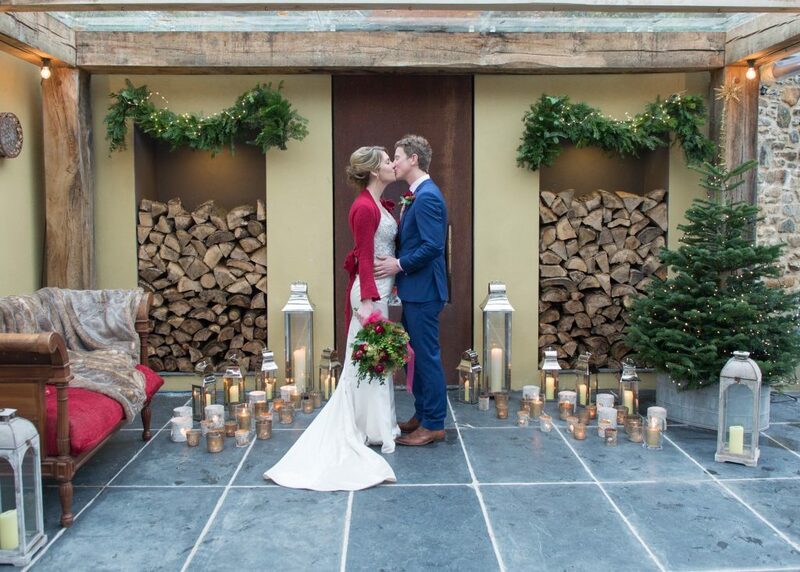 The lovely Kayleigh and Ben were our local, real life models who had got married in real life a few months earlier. They’re just so lovely together, it was like being at a real wedding! I wanted to do a shoot here in December because I wanted to give couples a realistic view of what the garden looks like here in the winter. There are no leaves on the trees and nothing is in flower but the venue still has its own natural beauty as you can see from the photos. We created two shoots on the same day so two hair and make up styles, two bouquets, two table settings and two decor set ups. I wanted to show how the venue can be adapted to suit different styles and looks. 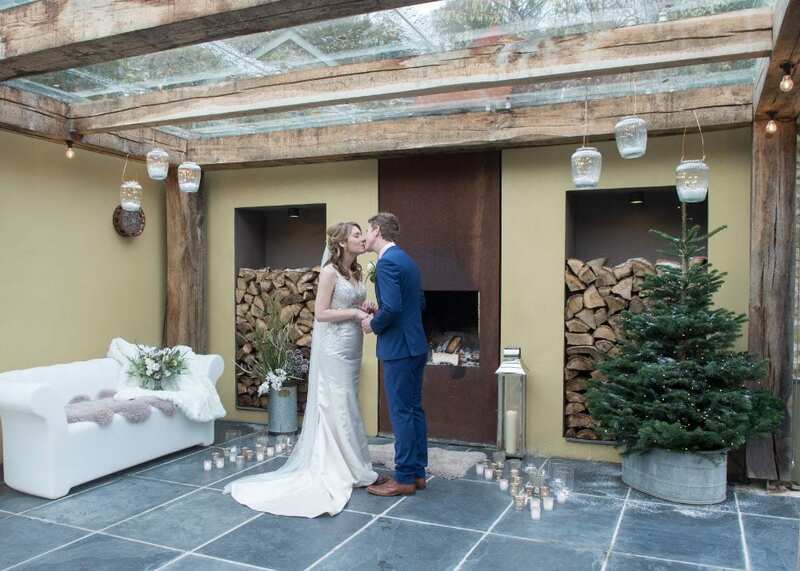 The first shoot was based on a white, snowy backdrop with a dusting of snow on the logs by the fire, white roses, orchids and cotton balls for the flowers and centrepiece, a white sofa and cosy rug in front of the fire, silver sequin table linen and white & metallic silver tea lights and candle holders. The second shoot brought in some colour with the bride dressed in a red cardi, red roses in the bouquet, red cushions on a wooden sofa. Other earthy colours of forest green and gold were used as accent colours with a green sequin table cloth, gold cutlery, tea lights and candle holders and those gorgeous red and gold macarons hand made by our very own local private chef, Harrie from Boo To A Goose. We also had Caroline and Chris from Baxter and Ted to do mini films of both winter elopement shoots which you can also see here on the website. Click here to see the white photo shoot. Click here to see the second photo shoot. Click here to watch the first mini film. Click here to watch the second mini film.